This omnibus contains two thrilling occult investigations featuring the urban fantasy sleuths Quincy Morris, grandson of Dracula’s killer, and the white witch Libby Chastain. In Play With Fire, houses of worship are burning around the U.S., from churches, to synagogues, to mosques. Usually while the places are full of people. The fires are initially dismissed as random acts of violence, until Morris and Chastain uncover the deadly meaning behind the destruction, and the terrifying cause the arsonists seek to serve. 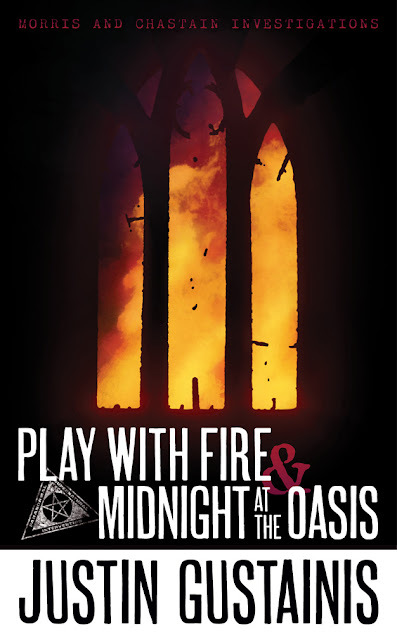 In Midnight at the Oasis, Middle Eastern terrorists have conjured a deadly djinn that will lay waste to America – unless Morris and Chastain can stop it first.